For many Jane Austen’s Pride and Prejudice is an enduring tale of true love. Whether it was Austen’s intention for us to view it as a love story versus a tale of how things like pride and prejudice blind us to the true character of a person does not stop us. How often have we dreamed of being Elizabeth when she and Darcy finally admit their feelings for one another? What would it be like to be a lady from the world of Pride and Prejudice having to abide by all the rules and expectations while in pursuit of a “single man in possession of a good fortune?” Well, wonder no more. Now there’s Marrying Mr. Darcy: The Pride & Prejudice Card Game by Erika Svanoe with design by Erik Evensen. This role play game is ideal for 2 – 6 players ages 13 and over, according to the box. Players choose one of eight female characters from Pride and Prejudice to play and improve with the objective of acquiring a suitor. Points are earned for obtaining Character cards: Beauty, Wit, Friendliness, Reputation, and Cunning. These are obtained though various situations as presented by the Event cards. Every suitor has his own preferences, and while it is possible to improve your character’s appeal it is also possible to gain an advantage by strategically ruining those of your rivals, leaving them no choice but to become an old maid. As if that weren’t fantastic enough, now there is going to be an Undead Expansion! Those who have read Pride and Prejudice and Zombies by Steve Hockensmith can see where this is going. In addition to improving your character, now there are the undead to contend with and curses to avoid; however, with the additional Event cards it is not so easy. The Undead Expansion also features a new set of cards, Instrument of the Living, containing weapons and cures. Even with the possibility of a cure one may still end the game as the undead. 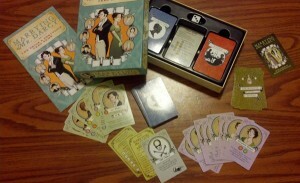 Thanks to Erika, we at DJABC got our hands on an advanced copy of Marrying Mr. Darcy with the Undead Expansion. We had an absolute fabulous time playing, with and without the expansion pack. We discovered that it was fun to play the different characters as every lady possesses her own unique advantages, and while the goal might be to obtain a husband that by no means guaranteed winning the game. One of my favorite statements in the game guide says, “If questions or discrepancies arise, discuss and agree upon a resolution in a ladylike manner.” We took this as encouragement to add a few extra rules and invent another variation, which I like to think of as cut-throat courting. Some of our more adult rules included toasting the parties, but that is completely optional. Forget Bridge and Poker. This is the perfect ladies card game. Marying Mr. Darcy is already available in stores. In anticipation of the Undead Expansion being released in stores this July 4th, and with the generosity of Erick Svanoe, we are hosting a giveaway for those in the US! Enter for your chance to win Marrying Mr. Darcy: the Pride & Prejudice Card Game and the Undead Expansion.